For twelve years Hobbies quinoloneresistant I developed and produced a number of useful gadgets to the cameras: for filming with the influx, defocusing, with multiplier prisms, feedback survey, obtaining combined titles and many others. They are all simple, reliable, affordable enough to manufacture on their own, what is easy to see by the example given here of a spring booster. 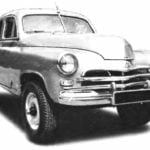 In the scope of camera “Lada” for the filming of mounting passages include a compendium with shutters — to displace from one image to others, and Packed aperture — for shooting with the “environment”. However, using these devices, how they are attached, getting good shots was very difficult, because, moving curtain or leash aperture, can’t achieve smoothness and uniformity of stroke. Therefore, the screen shots are facial palsy jerks, or very quickly. To address this shortcoming, I have produced a spring-loaded amplifier with duplechin lever. In figures 1 and 2 shows a single curtain. Spring booster “B” is attached directly to the compendium “A”. For this you need to drill and cut the compendium of the two lower holes M2,5 (Fig. 3, the node “A”). 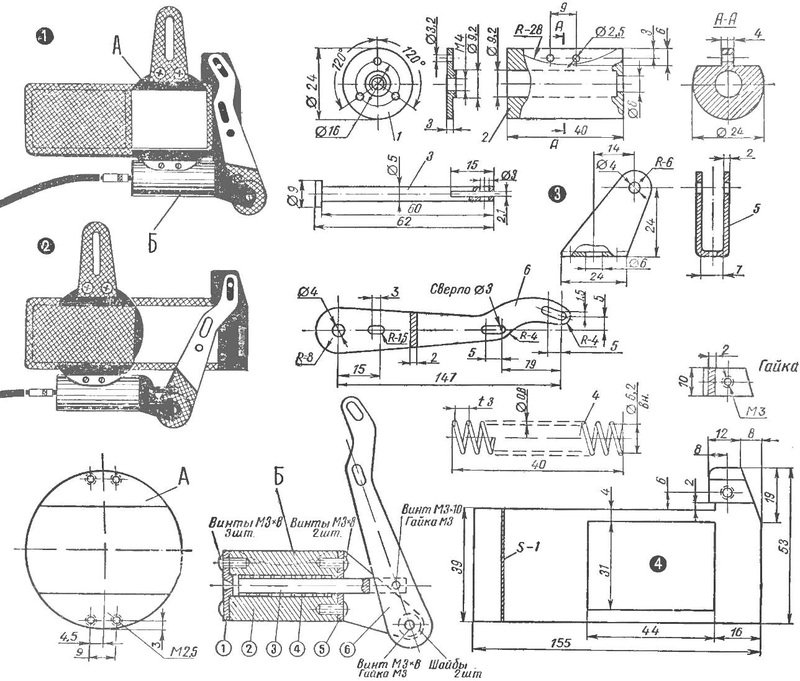 He spring amp lever manufactured according to the drawing (Fig. 3, the node “B”), detailing all dimensions, and additional explanation is not needed. You only need to notice that hole Ø 2,5 in the housing (Fig. 3, POS. 2) should be aligned with the holes M2,5 in the compendium. The saddle under the compendium in case you can not do propriu in this case, the 6×4 scallop along the entire length of the housing. The curtain that came with the camera, you can bring the drawing (Fig. 4). But it’s easier to make new NC sheet of aluminum or PCB thickness 1 mm. the inner side is glued the black paper. The nut is attached to the curtain by adhesive 88 or BF. Position you need to negotiate with the upper groove of the lever 6 of the amplifier (see Fig. 3). The shutter is inserted into the inner groove of the compendium. A cable release screwed into the hole M4 cap 1 amp. 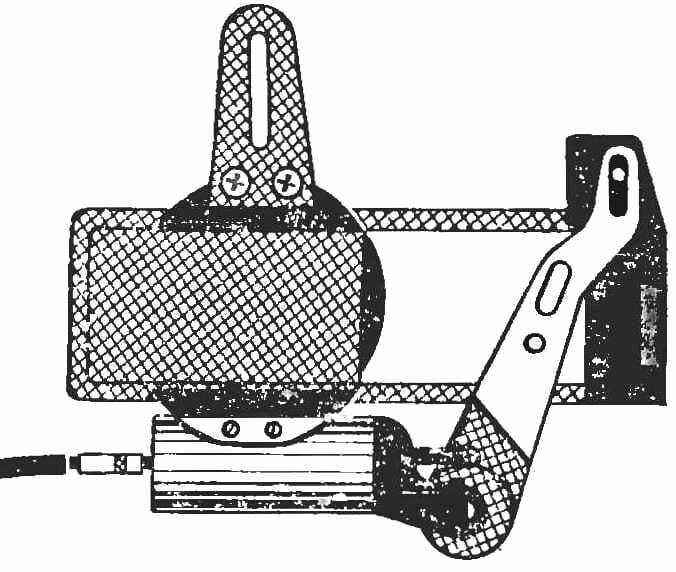 A compendium of cameras “Lada”, the B — tension clamp amplifier with a lever and a curtain. 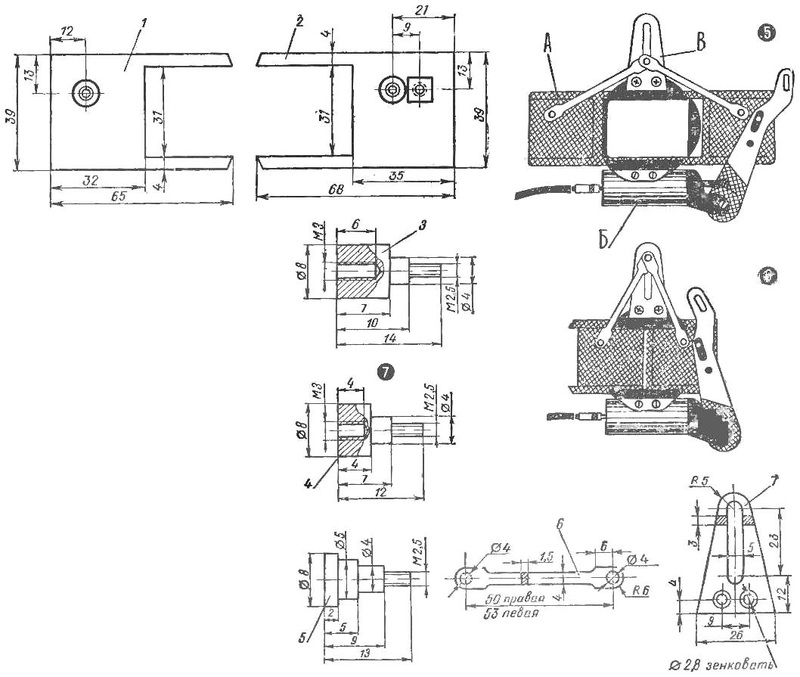 1 — body cap with a hole for cable release, 2 — amplifier, 3-stock, 4-spring, 5 — bracket, 6 — the lever. Fig. 4. Blind single with the nut. And — blind with a divorced halves B — tension clamp amplifier, In — the guide console. When you press the button of the lock rod 3 deflects the lever to the right the curtain will slowly close the lens. Release the rope under the action of the spring lever gently moves the curtain to the left: the lens is open. You can replace this cover of Plexiglas 1 mm thick, manufactured to the same dimensions but no window. Samuthiram fine sandpaper one piece with a smooth transition to another transparent. Such a shutter should be inserted in the outer groove of the compendium. When driving in front of the lens it will give the effect of “in a mist” and “fog”. In figures 5 and 6 shows another curtain, double, or “meeting-diverging”. http://www.yana.kiev.ua/country-37-kipr.html. For it is made of duralumin rail — stationary scenes “In” (Fig. 5), which is also attached ka compendium. For this you need to drill and cut into the top two, symmetrical with the lower (Fig. 3, A), holes M2,5. Myself double blind and details (Fig. 7) are also manufactured from sheet aluminum or PCB thickness 1 mm, covered with the inner side of the black paper. Leashes 3 (left) and 4 (right) blinds are glued and fastened with screws M3 itotal. The left half of the curtain is inserted into the inner groove of the compendium, and the right — outer. With the latter in closed position should overlap the first by 2 mm. Thrust (Fig. 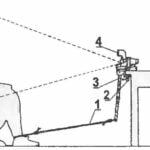 7 p. 6) are mounted with one end on a leash, and the other on the axis 5 of the slider inserted in the groove scenes. The rotation pulls on the leashes and the slider should be smooth, without jamming. Position square nuts on the right curtain should be aligned with the bottom groove of the lever 6 of the amplifier (Fig. 3). When you press the cable release knob and the deflection arm half blind through a system of rods and sliders on the wings move apart, opening the lens. Return movement of the lever will bring the blind by closing the lens. Using the spring booster and blinds allows you to diversify transitions, enhances the film buff.